Wine, beer, sangria, and a variety of frozen mixed drinks will be introduced for the first time at a US Taco Bell fast food restaurant starting on September 22 in Chicago. This location will also be the first to introduce tapas-style appetizers, have a mural painted by a local artist, and display an open kitchen. “You will literally be able to see the food,” said Meredith Sandland, Taco Bell’s chief development officer. “(Customers will be) able to see all the beautiful ingredients,” she added. The opening of this branch was first announced at the beginning of the summer, but without details such as opening date or exact location. 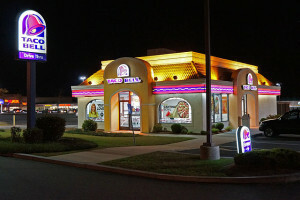 Another Taco Bell with a similar theme is planned to open in San Francisco later in September. Taco Bell says that the basic menu and food preparation at the new locations will be the same as at the more traditional stores under the brand, aside from the innovations named above. The new Taco Bell will open in the Wicker Park neighborhood of Chicago. They will be charging $4 ofr wine and beer, and $4.50 for sangria. The frozen drinks, called “Twisted Freezes” will contain rum, tequila, or vodka. These mixed drinks will be priced between $6.19 and $7.19.